GENEVA, NY, January 27, 2017: A half-century ago, Bill and Katherine Humphrey built All Western Nursery & Christmas Tree Farm on a dream — and a workload that ran from sunup to sundown. Among their daughter Jerrianne’s childhood memories is sitting on her dad’s lap and steering the tractor. But before Bill Humphrey died seven years ago, he counseled his wife and daughter to sell. Now in her early 80s, Katherine handles the books at All Western and directs crews of teenagers when Jerrianne can’t be there. For Jerrianne Scheiderich, it’s a two-hour drive, family in tow, most weekends from April through October. By November, Jerrianne and the kids move in for the hectic last lap — harvest. But it’s their on-farm research-based adoption of key integrated pest management (IPM) practices — and hosting other growers at twilight meetings and field days to show what they’ve learned — that have earned this mother-daughter team an Excellence in IPM award from the New York State Integrated Pest Management Program (NYS IPM). 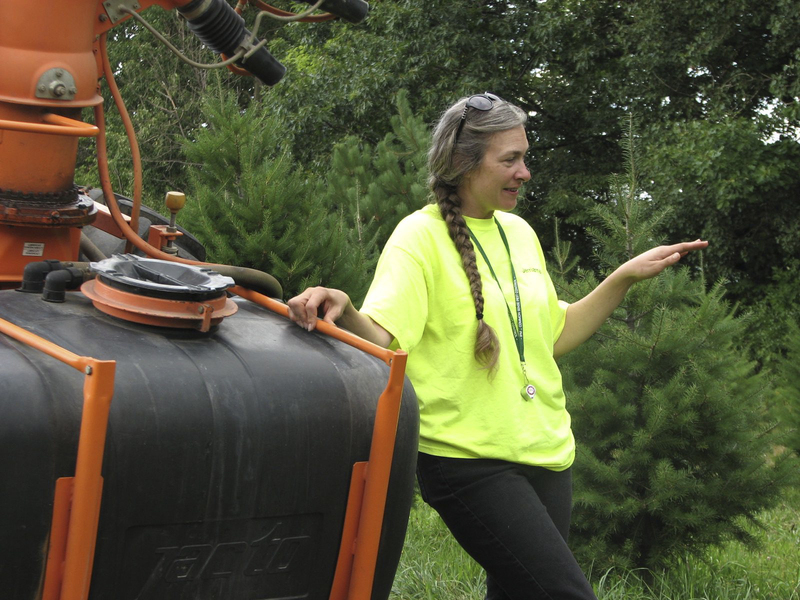 “For the past five years, Katherine and Jerrianne have provided a block of Douglas fir for one test and Fraser fir for another,” says Brian Eshenaur, a NYS IPM educator focused on ornamentals and Christmas trees. Cutting back on sprays is one concern; understanding which environmental factors foster bad-news blights is another. “Our research indicates that with sprays, timing is everything,” Eshenaur says. “Using the methods we’re testing at All Western, growers could cut sprays by up to seventy-five percent.” The research also documents the role site-selection plays for some tree species’ susceptibility to killer root rots. Jon Freckleton, a self-described “old seat-of-the-pants grower,” has been to those workshops. He credits Eshenaur, Katherine and Jerrianne as a strong influence on how he and others now grow trees. “We can see the results in evening demonstrations at the Humphrey’s farm, saving growers from exposure to spray and less sprays in the environment,” says Freckleton. Then it’s into the barn for Katherine’s homemade soup, while participants take turns at nearby microscopes to see just what their formidable opponents — tiny mites and aphid-like adelgids — really look like. Katherine Humphrey and Jerrianne Scheiderich received their award on January 27, 2017 during the Christmas Tree Farmers’ Association of New York’s annual conference.